Best Buy is completely dropping the ball this holiday season. We're hearing reports that customers who bought items on BestBuy.com on Black Friday (yes, nearly a month ago) will not be receiving their orders this year, with some of them even being cancelled right before Christmas. Congratulations Best Buy! You are the Grinch. "Due to overwhelming demand of hot product offerings on BestBuy.com during the November and December time period, we have encountered a situation that has affected redemption of some of our customers' online orders. We are very sorry for the inconvenience this has caused and we have notified the affected customers." That's not good enough. This wasn't some one-off mistake on a slow April day either, this was Black Friday! Their biggest day of the year, the Super Bowl of retail, the unofficial holiday for shopping. You can't mess up then. Especially if you're Best Buy. As a big box retailer, people camp out at your store a week in advance to participate in your Black Friday sales. They may be crazy but it's a clear show of faith that they trust Best Buy. It&apos;s Never Too Early To Camp Out For Black Friday...Right? And you know what? After this debacle, we should no longer trust Best Buy when it comes to Black Friday. Customers have taken their complaints to Best Buy's official community forum in hopes of getting heard. Their stories are all strikingly similar, people ordered a Black Friday deal on BestBuy.com and was confirmed with an order number and a charge on their credit card. They stopped shopping, they went about their lives expecting Best Buy to deliver. Then things got weird. For forum member Wavelandscott, it was a PS3. he had ordered a PS3 160GB Holiday Bundle on Black Friday but was eventually told it was backordered and then told it was cancelled. The problem is, Best Buy is selling that same exact PS3 bundle for regular price on its website right now. Another guy had it worse: he ordered a laptop on Cyber Monday and actually received shipping confirmation. When he never received the item, he contacted Best Buy who told him it shipped and to wait. He waited. And then he contacted UPS who said they never received the shipment. He contacted Best Buy who were now saying that they were actually sold out of the laptop and the only thing they could do was cancel the order. 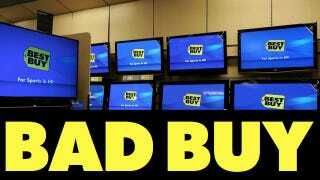 From cameras to laptops to consoles, Best Buy has backed out of countless orders mere days from Christmas. Yes, there are bigger worries in the world than having a retailer screw up your online order of some shiny new gadget. But that doesn't mean companies like Best Buy should get away with a screwjob like this. If Best Buy can't fulfill your order, they shouldn't take your order. If Best Buy needs to cancel your order, don't wait until a few days before Christmas when people are out of time. If Best Buy can't figure out Black Friday, don't open on Black Friday.